What is Induction Heating and How do Induction Coils Work? An induction heating system consists of an induction power supply for converting line power to an alternating current and delivering it to a workhead, and a work coil for generating an electromagnetic field within the coil. The work piece is positioned in the coil such that this field induces a current in the work piece, which in turn produces heat. The water-cooled coil is positioned around or bordering the work piece. It does not contact the work piece, and the heat is only produced by the induced current transmitted through the work piece. The material used to make the work piece can be a metal such as copper, aluminum, steel, or brass. It can also be a semiconductor such as graphite, carbon or silicon carbide. For heating non-conductive materials such as plastics or glass, induction can be used to heat an electrically-conductive susceptor e.g., graphite, which then passes the heat to the non-conducting material. Induction heating finds applications in processes where temperatures are as low as 100ºC (212°F) and as high as 3000°C (5432°F). It is also used in short heating processes lasting for less than half a second and in heating processes that extend over several months. Induction heating is used both domestic and commercial cooking, in several applications such as heat treating, soldering, preheating for welding, melting, shrink fitting in industry, sealing, brazing, curing, and in research and development. Induction produces an electromagnetic field in a coil to transfer energy to a work piece to be heated. When the electrical current passes along a wire, a magnetic field is produced around that wire. The first method is referred to as eddy current heating from the I²R losses caused from the resistivity of a work piece’s material. The second is referred to as hysteretic heating, in which energy is produced within a part by the alternating magnetic field generated by the coil modifying the component’s magnetic polarity. Hysteretic heating occurs in a component up to the Curie temperature when the material’s magnetic permeability decreases to 1 and hysteretic heating is reduced. 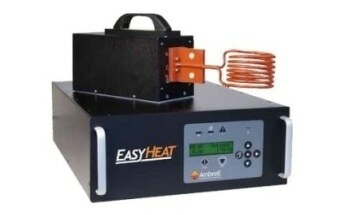 Eddy current heating constitutes the remaining induction heating effect. When there is a change in the direction of electrical current (AC) the magnetic field generated fails, and is produced in the reverse direction, as the direction of the current is reversed. When a second wire is positioned in that alternating magnetic field, an alternating current is produced in the second wire. The current transmitted through the second wire and that through the first wire are proportional to each other and also to the inverse of the square of the distance between them. When the wire in this model is substituted with a coil, the alternating current on the coil generates an electromagnetic field and while the work piece to be heated is in the field, the work piece matches to the second wire and an alternating current is produced in the work piece. The I²R losses of the material resistivity of the work piece causes heat to be created in the work piece of the work piece’s material resistivity. This is called eddy current heating. With the help of an alternating electric field, energy is transmitted to the work piece with a work coil. The alternating current passing via the coil produces the electromagnetic field which induces a current passing in the work piece as a mirror image to the current passing in the work coil. The work coil/inductor is a part of the induction heating system that displays the effectiveness and efficiency of the work piece when it is heated. Work coils are of numerous types ranging from complex to simple. The helical wound (or solenoid) coil is an example of simple coil, which consists of many turns of copper tube wound around a mandrel. A coil precision-machined from solid copper and brazed together is an example of complex coil. The work piece that needs to be heated and the work piece material decide the operating frequency of the induction heating system. It is vital to use an induction system that provides power over the range of frequencies suitable for the application. The reasons for various operating frequencies can be understood by what is referred to as the “skin effect”. When the electromagnetic field induces a current in a component, it passes primarily at the component surface. Figure 3. (a) High frequency induction heating has a shallow skin effect which is more efficient for small parts; (b) Low frequency induction heating has a deeper skin effect which is more efficient for larger parts. When the operating frequency is higher, the skin depth is shallower. Similarly when the operating frequency is lower, the skin depth and the penetration of the heating effect are deeper. Skin depth/penetrating depth is based on the temperature, operating frequency, and material properties of the part. For example (see Table 1), a 20mm steel bar can be stress-relieved by heating it to 540°C (1000°F) using a 3kHz induction system. However, a 10 kHz system will be needed to harden the same bar by heating it to 870°C (1600°F). Hence it can be said that higher operating frequencies, mostly more than 50kHz, can be used to heat smaller parts with induction and lower operating frequencies can be used to heat larger parts more efficiently. In the case of advanced solid-state induction power supplies with embedded microprocessor control systems, consistent and effective heating techniques are achievable based on the fact that all parts are placed at a consistent location within the coil. An induction heating system comprises a tank circuit, a power supply, and a work coil. In industrial applications, there is sufficient current passing via the coil to need water cooling; therefore a basic installation contains a water cooling unit. The alternating current from the AC line is converted through a power supply to an alternating current that is in line with the combination of coil inductance, workhead capacitance, and component resistivity. The work piece material dictates the heating rate and power needed. Iron and steel heat easily as they have higher resistivity while aluminum and copper need more power to heat due to their lower resistivity. Certain steels are magnetic in nature hence the resistivity and hysteretic properties of the metal are used when heated with induction. 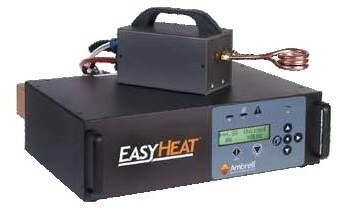 The steel loses its magnetic properties when heated above the Curie temperature (500-600°C/1000-1150°F); however eddy current heating provides the required heating technique for higher temperatures. The power required is determined by factors such as the type of material, size of the work piece, required temperature increase, and the time to temperature. According to the size of the work piece to be heated, the essential factor to be considered is the operating frequency of the induction heating system. Likewise, in the case of smaller work pieces a higher frequency (>50kHz) is needed for efficient heating, and in cases of larger work pieces a lower frequency (>10kHz) and more penetration of the heat is generated. When the temperature of the heated work piece increases, heat is also lost from the work piece. Radiation and convection losses from the work piece develop into a very essential factor with higher temperatures. Insulation methods are frequently used at high temperatures to reduce heat losses and to decrease the power required from the induction system. This information has been sourced, reviewed and adapted from materials provided by Ambrell Induction Heating Solutions. 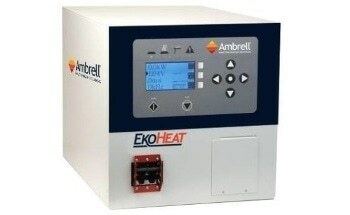 For more information on this source, please visit Ambrell Induction Heating Solutions.